From Miramar to the White House? 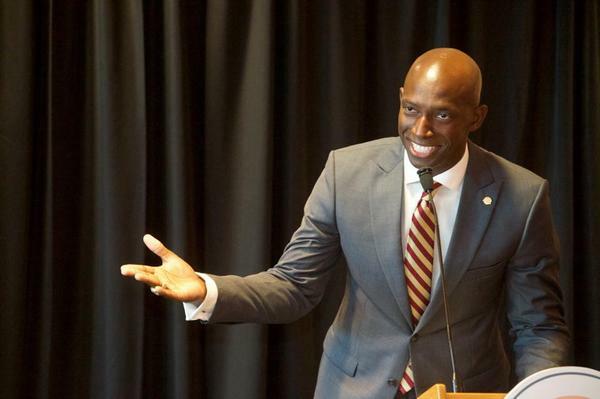 Newly re-elected Miramar Mayor Wayne Messam has launched an exploratory committee to examine a presidential campaign. He's hoping to enter the long list of Democratic presidential hopefuls and is focusing on the issues of gun control, immigration and the environment. Since 2015, Messam has overseen a city of approximately 150,000 residents, and he says proximity to his community is what sets him apart from more experienced candidates. "Name recognition does not define leadership," Messam says. He joined Luis Hernandez on Sundial to talk about his presidential campaign. An interview with Miramar Mayor Wayne Messam. WLRN: Why have you decided to set your aspirations for the presidency, instead of pursuing Broward County office or a statewide office? MESSAM: You think about the pressing issues of this country in terms of climate change, gun violence, job opportunities and being able to provide for your family, individuals having to work two and three jobs just to make ends meet. And when I reflect back even to my parents, who were immigrants from Jamaica, my father was a contract sugar cane cutter. He cut sugar cane for 75 cents per roll of cane. And my father migrated to this country so that he [could] chase the 'American Dream.' And I am living that dream. I was able to get a football scholarship to Florida State University to be on a national championship team in 1993 -- my freshman year [I was] playing for legendary coach Bobby Bowden -- to have a shot at the NFL. When my NFL career was cut short I started a construction business with my wife -- creating jobs. We built one of the most sustainable elementary schools and having the opportunity to serve nearly 150,000 residents as the mayor. The urgency of change cannot wait. And I'm not convinced that the answers are coming from Washington. Mayors are the closest to the American people and we understand the issues on the ground. And when you look at the lack of urgency coming out of Washington change cannot wait. You were part of a group of mayors last year that sued former Governor Rick Scott for a law which prohibits local municipalities from enacting their own gun restrictions. Why did you feel it was important to join that group? I felt it was important because I received a number of phone calls after Parkland, which is only 15 minutes up the road from Miramar. Even our police officers went up in response to assist law enforcement there. [Oour residents] asked me a crucial question: 'Mayor, what are you going to do to ensure that Glades Middle, Miramar Elementary, Everglades High School, Miramar High School, is safe?' I could not answer them from the standpoint of what I could propose because of this law that has that punitive impact to chill local elected officials from proposing just commonsense things like not allowing guns in our parks or not allowing guns in City Hall. And so because of that I was one of the leading mayors to file that lawsuit last year that is now working its way through the process and will start litigation. There has been some subsequent lawsuits filed and we are optimistic. We should at least be able to have the discussion as local elected officials. Environment is another big issue for you. [It] already passed in court that a group wants to do some exploratory oil drilling near the Everglades [near Miramar] and they have permission to do so. How exactly could you stop that? There's a series of permits that is required. The state actually said no. It was the court that is forcing the state Department of Environmental Protection to issue one of the permits that are needed. There still are some land use entitlement issues at Broward County that has to take place. But here's what the real issue is. You're talking about one of our most fragile and pristine natural resources, the Everglades, and on top of that it is the source of our drinking water for perhaps 8 million people in South Florida. And they're threatening to pierce the lime rock to inject God knows what into the soil just to check to see if there's oil in the Everglades. It's just an asinine thought process. And to think that we should be holding our breath, to think that one mistake can irreversibly change the quality and safety of our drinking water. For me as a mayor in our backyard not to stand up and fight to stop this I wouldn't deserve to be in this seat. Again these are the issues that we're facing. When I think about these pressing issues we are facing in the city of Miramar that is why change can't wait and the American people need an agent who can represent them in these very tough issues that we are facing.